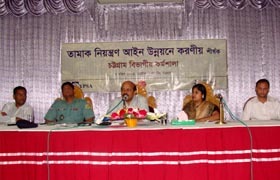 YPSA and WBB trust with the support of TFK recently organized Chittagong divisional workshop on “Review and Development of Tobacco Control Act’05”. Advocate Rehena Kabir Ranu presided the workshop and Md.Jafar Alam, Ad. District Commissioner (Revenue) was the chief guest and Mr.Shakhawat Hossain Deputy Police Commissioner was the special guest. Representatives from different local Government institutions including Chittagong City Corporation and NGOs, Civil society, Teachers and Journalists attended the workshop. The government of Bangladesh enacted the Bangladesh Tobacco Control Act 2005 and rules in 2006. The law specifically ensures for bans on advertising, promotion and sponsorship, smoking in public places and public transports and requirements for visible warning on cigarette packets etc. However some limitations in the enacted law were identified by the citizen. To protect present and future generations from the devastating health, social, environmental and economic consequences of tobacco consumption the tobacco control law 2005 should be reviewed, strengthened and enforced. Through this divisional workshop some specific recommendations and suggestions were collected to present in the upcoming National workshop.